In one of the earliest adventures between the Justice League and Robin, the future leader of the Teen Titans makes a really good impression. 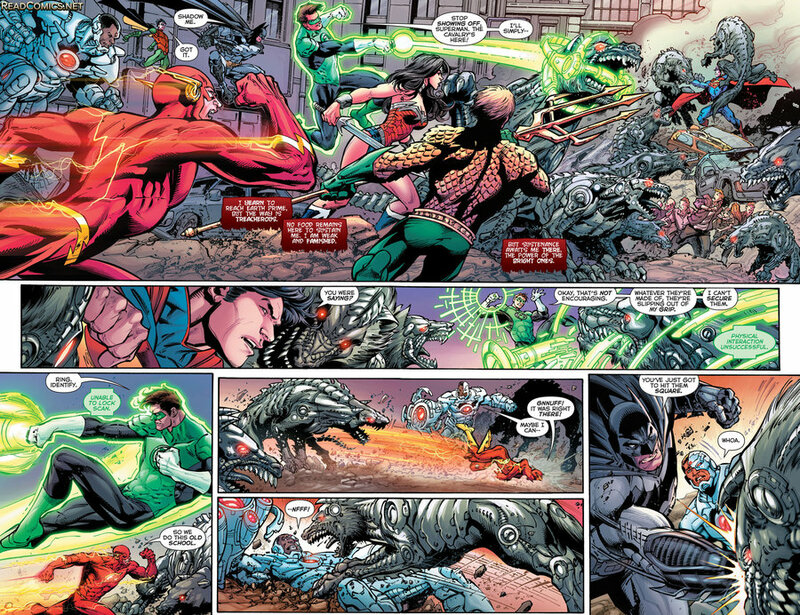 Spoilers for Justice League # 51. 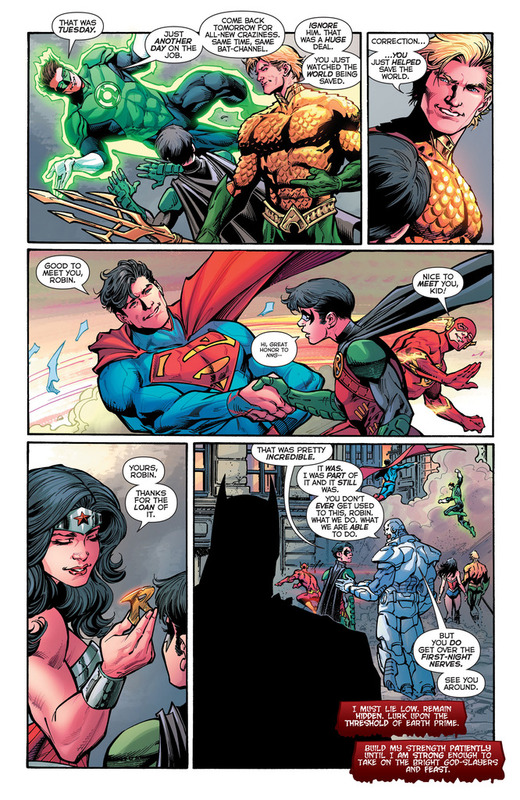 So in this issue, Batman sees it as a good time to bring his sidekick Robin to one of the days he works together with the Justice League. Of course that brings in some levity and humor. The timeline is a bit hazy, but thats really OK because you ougtha buy the book (which is out now by the way). Trouble is brewing all over the place and the League responds with Robin in tow. The League gets their asses handed to them but slowly but surely Robin proves that he’s an equally important member of the team for this fight. 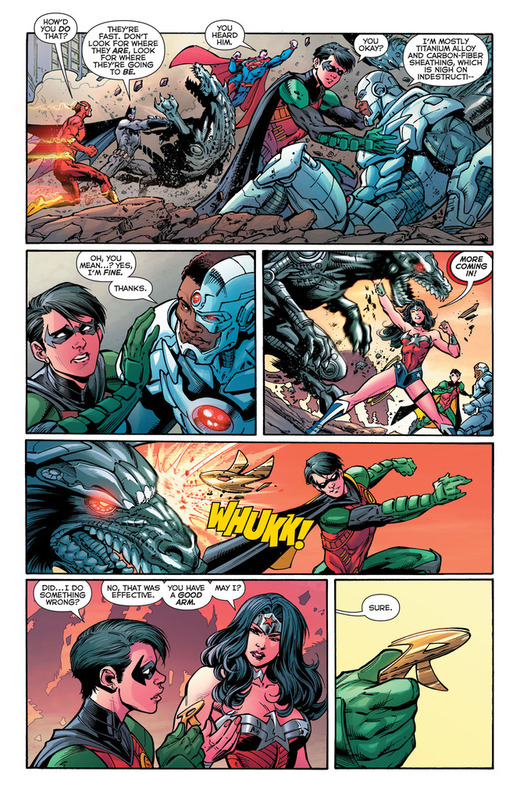 He shows compassion to Cyborg after surviving an attack and at the same time impresses Wonder Woman with his aim and skill in his shurikens. 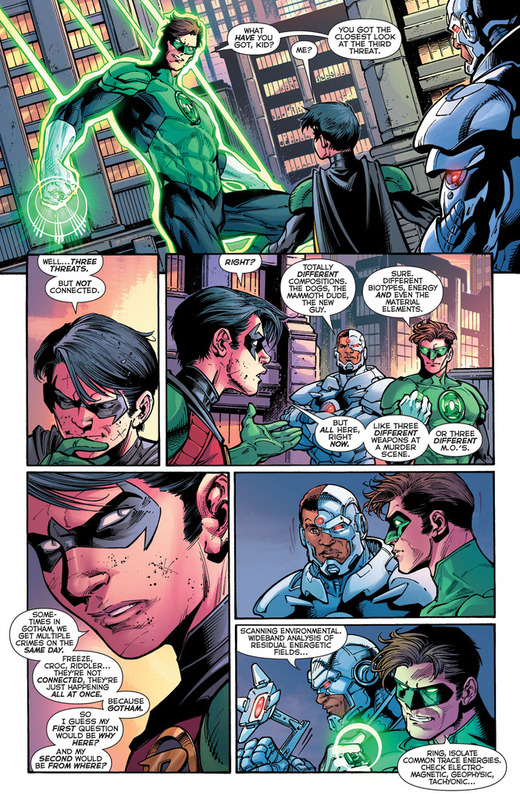 There’s also one part of the story where both Green Lantern and Cyborg recieve some insightful things from Robin, based on his work with Batman in Gotham City. They ofcourse make good use of the tip later in the story. 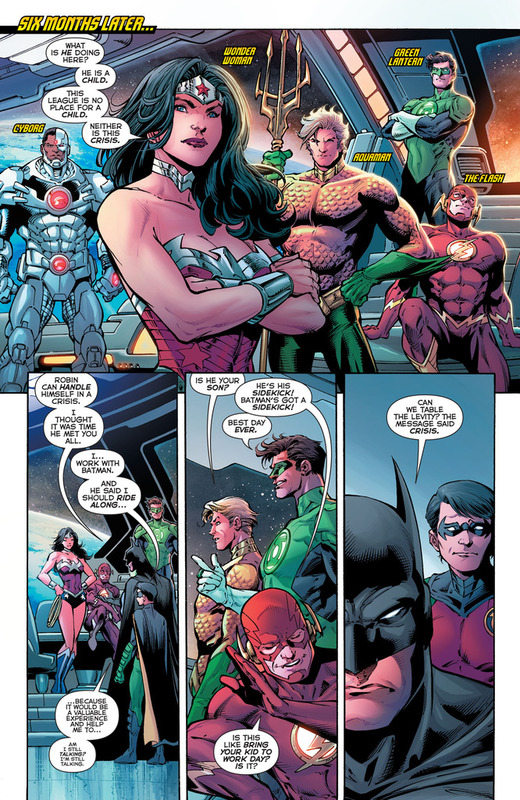 Later, after the hail mary save by Cyborg, the team show their gratitude to Robin with both Hal and Aquaman showing how impressed they are. 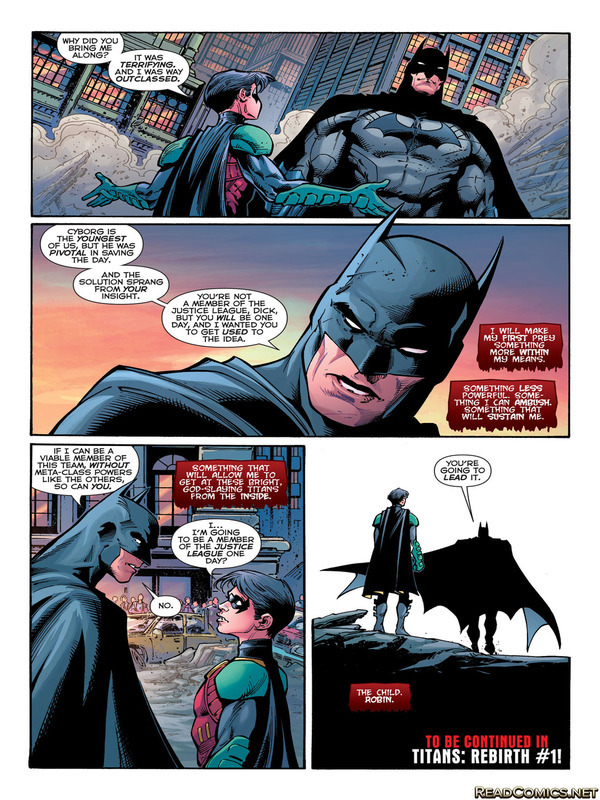 In the end of this adventure, Batman imparts something important to his son sidekick; that he is grooming him to become not just a member of the Justice League, but a possibility of becoming the leader. 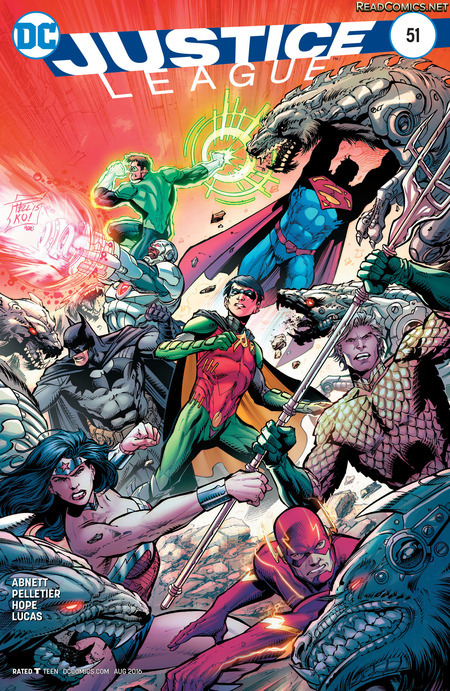 Definitely picking up Justice League # 51 together with the Darkseid War in collected form.